Marble is one of the most elegant natural materials known to human kind. 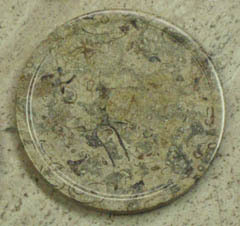 It is highly prized for applications such as art, archutecture, and design, due to a vareity of factors, including its ability to take a very high, shimmering, smooth polish, and its semi translucence, which allows light to penetrate the surface of the stone just slightly, in some colors, giving an illuminated piece a slight glow. Now this attractive high end stone is available in your home, in a vareity natural stone drink coaster sets which you can choose from. Onyx stone is one of the most impressive materials in the world. Multicolored, shimmering, and polished to a smooth perfection, you can get lost gazing into the one of a kind hues and patterns found in the surface of each and every indidvidual coaster. 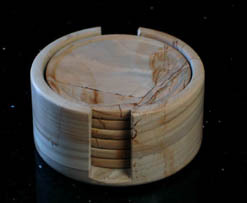 These pieces are sold in sets of six, and come matched with an attractive natural stone holder, which is built to match the entire set, both containing it, and enhancing its features. Million year old fossil stone. 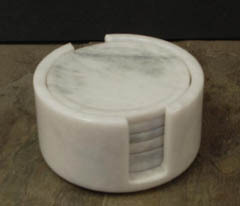 This is a type of marble that has travelled through eons, experiencing the rise and fall of the dinosaurs, witnessing the birth, death, and rebirth of whole species, and standing as silent testament to the creation of entire mountain ranges, and their inevitable destruction at the hands of chaos. Within the surface of these coasters, you can see that storied past, in the form of dendritic impressions of ancient creatures, leaves, micro organisms, and shells, which adorn its face. 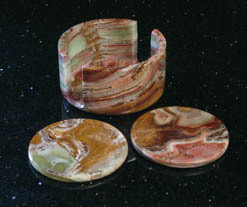 Subdued tan colors dominate the surface of these highly polished and stylish beverage coasters. This soft, understated perfection, is broken by fierce lines of contrasting color, which shoot across the face of the stone, giving each piece a kind of personality, an individual style that makes them unlike any other piece in the entire world. Pure white marble, the essence of perfection, is shattered in a slow languid manner, by bits of whisp, softly floating trails of cloud stuffs that slide merrily across the surface of the marble, leaving trails of hue randomly across each coasters face. These strands of faded gray give the entire piece a look of clouds, floating lazily in the air, drifting on a random wind, not a care for anyone in the world. 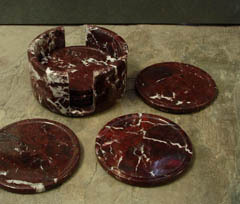 Red zebra marble drink coasters are extremely powerful, vivid pieces, that tend to dominate a space. Crimson red in demeanor, the fierce powerful surface is shattered by bolts of white lightning, which rip through the sea of red, making it even more intense, more energetic, until each coaster almost feals electric to the touch. Coupled with an equally unique matched marble stone holder.